Have too many tools laying around and not enough space to store them? 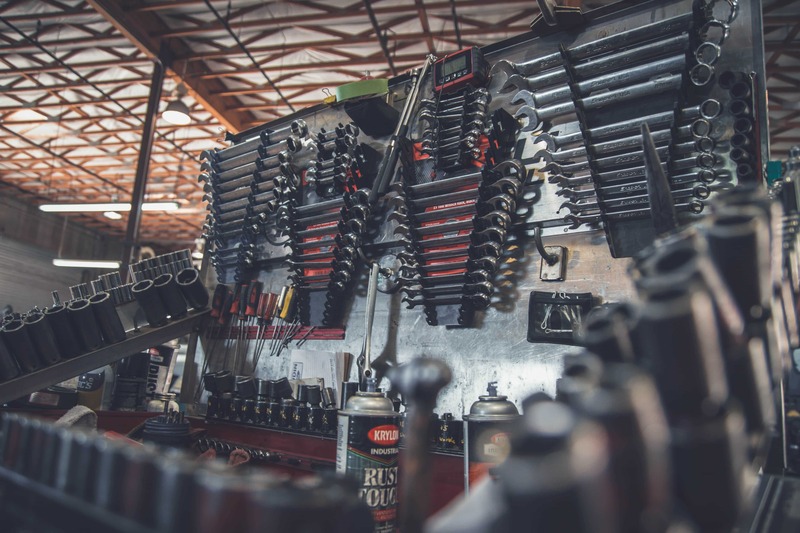 Have trouble finding tools in your shop because they are unorganized? It sounds like you may need a new tool chest. There are thousands of different tool boxes on the market, but only a few are worth their cost. 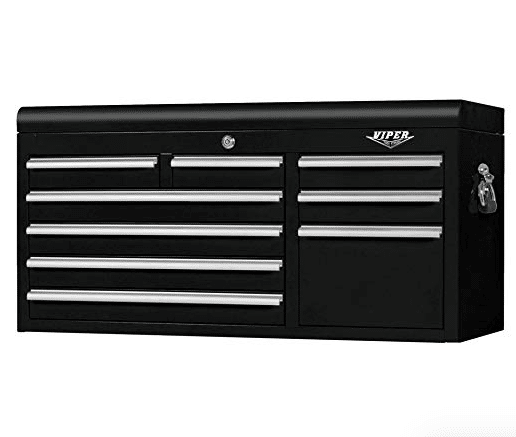 We picked out 5 great tool chests that were less than $1,000 to help you out. We looked at durability, features, customer reviews, and price to come up with these best options. Are you tired of using a toolbox that’s falling apart, too heavy, or not large enough to hold the tools you need for a job? Montezuma has solved these problems by manufacturing their DX411B Portable Tool Box. 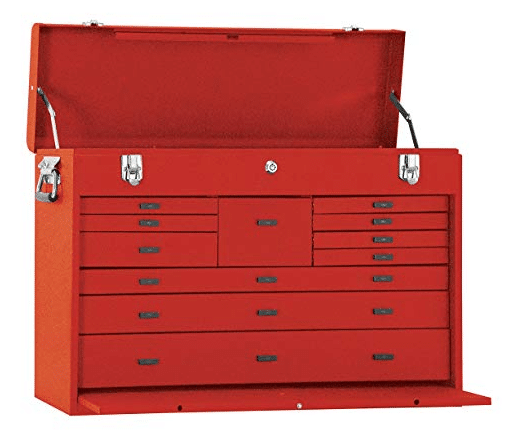 This product is guaranteed to hold an entire collection of tools for both professionals and anyone who needs a reliable toolbox for home or auto maintenance. Montezuma is known for their heavy duty and high-quality triangle toolboxes. The triangular lid design keeps tools locked inside. A dual pin locking system also ensures security. This box is also outfitted with weather stripping to prevent dust and dirt from infiltrating any creases. This model in particular holds both metric and S.A.E. (Society of Automotive Engineers) tools. 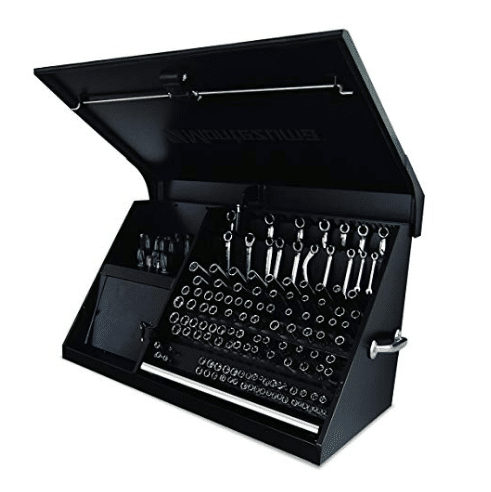 This toolbox is intended for the user to be able to store all their items within one secure space. The DX411B includes several convenient holders for a variety of tools, as well as open compartments for any miscellaneous products such as a ruler, tape, or glue. This model stands out from others for its high quality and spaciousness. At 41” wide x 18” deep, it is hard to find another model that offers as much storage. At its largest size it can be pricey, but the high price tag includes ample space for large amounts of tools. However, if this is even too much for the average handyman, Montezuma also sells the same model in several smaller sizes as well, the smallest being 23” wide x 13” deep. This way, even those with less tools can benefit from owning a quality toolbox that has the DX411B, at an exceptionally lower price than the largest size. Larger toolboxes can get expensive. 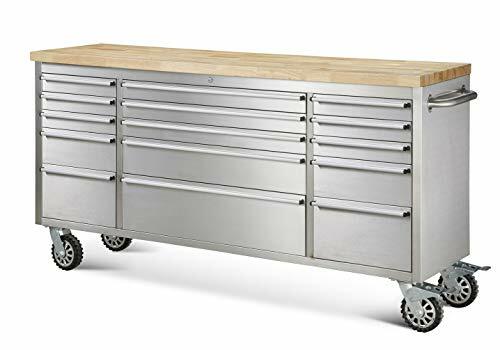 For any homeowner or professional looking for something larger than a portable tool chest to hold many tools and supplies, Thor Kitchen’s 72” wide tool chest is a quality and multipurpose option. It will not only provide ample storage but also an additional work station. 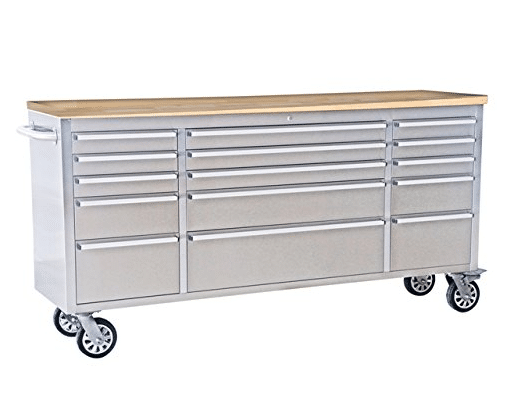 With 15 drawers of storage, this product holds large amounts of tools and supplies. Thor Kitchen designed their tool chest to make a user’s tools conveniently located together, so time that could be spent working isn’t used searching for a specific screwdriver. The drawer system encourages organization, so that objects can all be placed in one drawer together. The chest securely is built with 100 pound rated drawer slide, a testament to its security and smoothness. At 280 lbs., this is not a product that’s meant to be lifted a lot. It is intended to stay centrally located in a workstation or garage. However, the heavy-duty caster wheels make travelling possible, unlike stationary tool chests. Convenient handles are placed on the side for travel and convenience. In the event that a user might need to bring this chest on the go, the workstation makes it possible to saw, cut, or build along its smooth wooden surface. It’s rubberwood top makes for a quality workstation. This chest is made with a high-quality stainless steel that gives it a sleek look and is anti-fingerprint. At a decent price, and with a risk-free 30 day no questions asked return policy, Thor Kitchen has made storing tools within its smooth, stainless steel chest more convenient and manageable. Are you looking for a chest with a chic quality to make your workroom more eclectic? 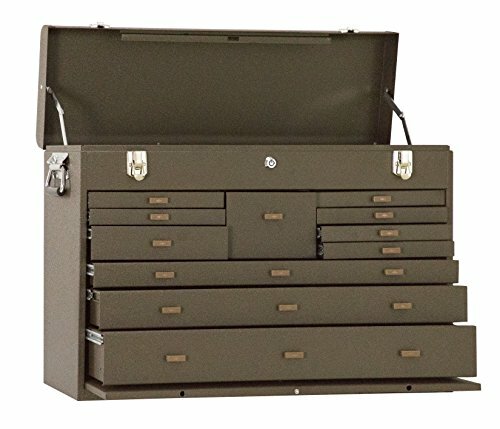 The Kennedy Manufacturing 52611B is a unique tool chest with a beautiful design and classic look. Unlike most tool chests on the market today, this chest has a vintage quality and appearance. From a company that produces products similar to those manufactured in the 1910s, it’s no wonder why this stylish chest is retro and also still an efficient tool storage unit. With 60lb steel friction slides that are two-piece and welded, this sturdy chest will hold heavy objects in place without coming apart despite its many compartments. Part of the box’s distinct look is the varying sizes of all the drawers. This enhances the box’s unique appearance and gives users plenty of options about where to store their belongings. While some drawers are perfect for small nails, others are spacious enough to hold drills. This keeps smaller items that are easily lost separate from larger ones. Each drawer is made with 22-gauge industrial metal, stores up to 3976 cubic inches, and holds up to 90lbs per drawer. A tubular lock additionally ensures all the contents are secure. Despite its briefcase like appearance when locked, when the chest opens and expands, it has sufficient depth. A front drop panel conceals additional sliding doors and secures the entire chest in place. Felt lining functions as protective measures against tool damage on metallic surfaces. Retro look might not appeal to all users. 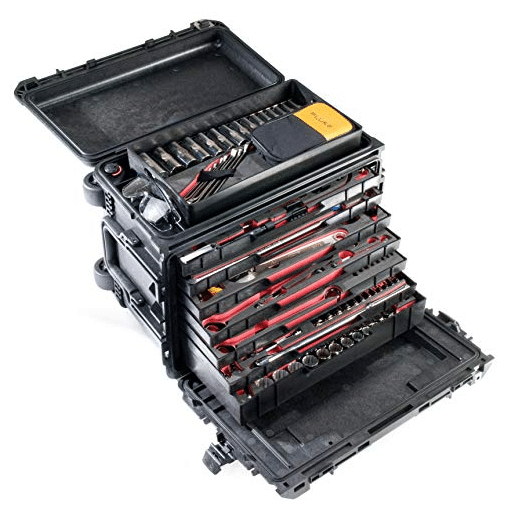 Is your current toolbox not portable or difficult to carry with you on the go? A great solution is the Pelican mobile tool chest, which is designed for both professionals and homeowners alike to transport efficiently. A trusted company that manufactures a variety of toolboxes, chests, and cases, Pelican is known for heavy-duty products. 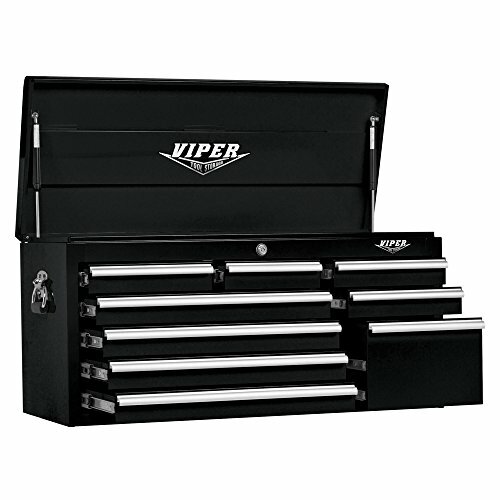 At 23.9” x 17.9” this box is large enough to host a variety of small and large tools. With sturdy 2” wheels that are designed to roll over many surfaces, and a pull-out telescoping handle for easy rolling, this tool chest resembles a suitcase. It can easily be placed in a car, pickup truck, or van. This chest contains Pelican’s signature latching system with four in total on this box: two for the lid and two for the front. These are double-throw configurations with butterfly compression closures. When locked, the box compresses tightly and prevents opening. Users can also buy a security cable or padlock for additional security. The secure multi-level design of this box keeps its contents tightly secure and prevented from being damaged during rough transportation. However, note this box does not include foam or felt interiors. Users interested in that additional interior protection might have to purchase foam inserts separately. Rather than functioning as a storage space for delicate objects, this box is meant for tools capable of being transported in rugged travel. This box contains several shelves that can host a range of objects. However, if you are looking for several deep drawers this might not be your best option. The Pelican mobile tool chest comes with one deep drawer, but this box will still host many small to medium tools 3”. Are you tired of using a boring chest to store all of your tools and supplies? The Viper V4109BLC model is a chic alternative to a traditional handyman chest that will help you build or repair in style. Viper’s chest has striking colors that give this model a cutting-edge look. The standard style is black and white, but silver, white, and neon pink options are available that give this chest a rock n’ roll quality. A powder coated finish protects the exterior from being damaged while working and ensures greater longevity. The chest is 41” tall, making it large enough to hold many small to medium sized objects. It has 9 drawers that are built with 18G of steel. While it is not the biggest chest on the market, it is still made with just as much integrity as any other larger option. 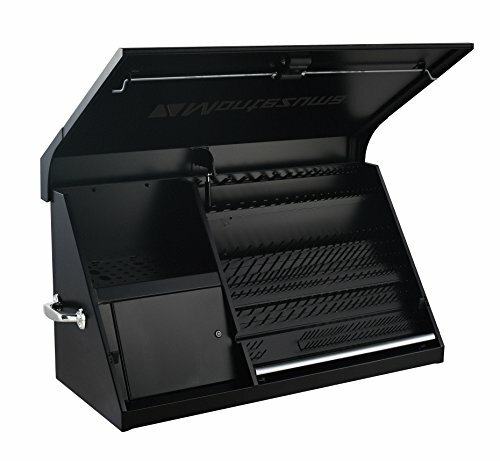 The tough 100lb rated full extension and ball bearing drawer slides secure its objects in place with a simple locking system. The Viper supports a large amount of storage with just one lock. Additionally, gas struts on the lid keep the box propped up. Viper manufactured this model for use anywhere. Whether in a home office, busy workroom, garage, or outside, the box is compact enough to transport to a variety of locations. Two handles on the exterior make traveling easier. 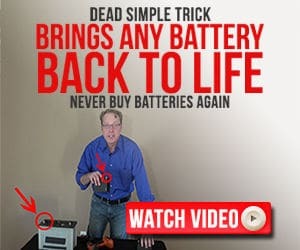 This box also has a limited lifetime warranty. Overall, this is a tool chest for style-conscious builders and professionals looking to spice up their gear.